Orchha, the capital of the mighty Bundela Rajput kings, spells history almost in every part of the city. Orchha is a tiny farming town dotted with historical sites. 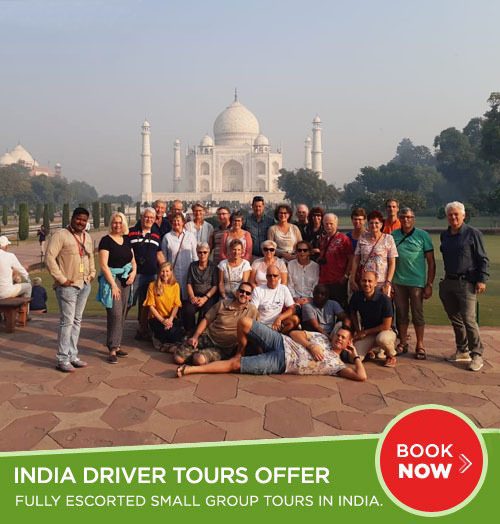 Raj Mahal: Situated to the right of the quadrangle, this palace was built in the 17th century by Madhukar Shah, the deeply religious predecessor of Bir Singh Ju Deo. The plain exteriors, crowned by chhatris, give way to interiors with exquisite murals, boldly colourful on a variety of religious themes. Get a good guide inside here to take you all over the complex, including locked rooms, for a tip. Jehangir Mahal: Built by Raja Bir Singh Ju Deo in the 17th century to commemorate the visit of Emperor Jehangir to Orchha. Its strong lines are counterbalanced by delicate chhatris and trellis work, the whole conveying an effect of extraordinary richness. Rai Parveen Mahal: Poetess and musician, Rai Parveen was the beautiful paramour of Raja Indramani (1672- 76) and was sent to Delhi on the orders of the Emperor Akbar, who was captivated by her. She so impressed the Great Mughal with the purity of her love for Indramani that he sent her back to Orchha. Ram Raja temple (closed during the afternoon): This is the center around which the life of Orchha revolves. The presiding Deity here is Lord Ram. The idols were meant to be installed in the magnificent Chaturbhuj temple, but when the idols, once kept on the ground(where they are today), refused to move. So a makeshift temple was built around it and is known as Ram Raja temple. It has an excellent courtyard, tiled with marble and the temple in pink and yellow colors, gives a bright look. No cameras or bags allowed inside. Chaturbhuj Temple: Built upon a massive stone platform and reached by a steep flight of steps, the temple was specially constructed to enshrine the image of Rama that remained in the Ram Raja Temple. Lotus emblems and other symbols of religious significance provide the delicate exterior ornamentation. Within, the sanctum is chastely plain with high, vaulted walls emphasizing its deep sanctity. Find the hidden stairs to the roof for a view of the entire area. The young keyholder will unlock the door to the hidden stairs and take you up for some money and show you around which he supposed to do for free. Laxminarayan Temple: A flagstone path links this temple with the Ram Raja Temple. The style is an interesting synthesis of fort and temple moulds. The interiors contain the most exquisite of Orchha’s wall paintings. Covering the walls and ceiling of three halls, these murals are vibrant compositions and cover a variety of spiritual and secular subjects. They are in excellent state of preservation, with the colours retaining their vivid quality. Phool Bagh: Laid out as a formal garden, this complex testifies to the refined aesthetic qualities of the Bundelas. A central row of fountains culminates in an eight pillared palace-pavilion. A subterranean structure below was the cool summer retreat of the Orchha kings. An ingenious system of water ventilation connects the underground palace with Chandan Katora, a bowl-like structure from whose fountains droplets of water filtered through to the roof, simulating rainfall. 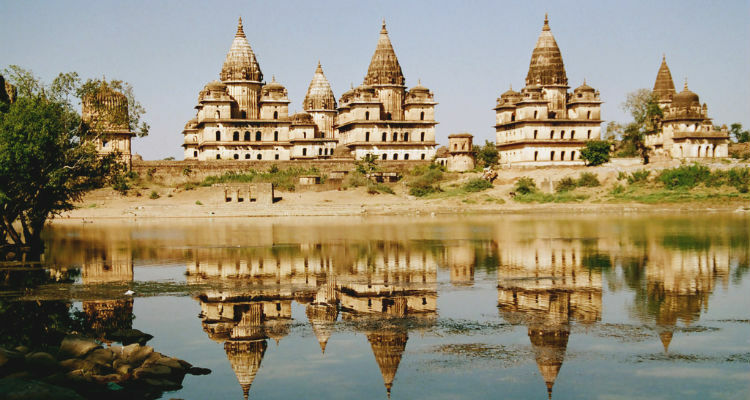 Cenotaphs: There are 14 Chhatris or Memorials to the rulers of Orchha, grouped along the Kanchan Ghat of the river Betwa on the south end of town. You can climb up to the roof for views of the river.